Looking for a different idea for spring break? Sebastian should be on your bucket list. Sebastian is a charming town situated between Vero Beach and Melbourne Beach on Florida’s east coast. This tranquil riverfront escape provides a variety of interesting options, including watersports, yummy local restaurants and homespun hotels, many offering reasonable rates. Families on spring break may want to shake things up this year, bypassing traditional beach escapes and instead opt for a riverfront getaway. One of the most exciting adventures for outdoor family enthusiasts to experience is the St. Sebastian River Preserve State Park, which is best described as primitive Florida. With more than 22,000 acres of backwoods to explore teens, tweens and in-betweens won’t get bored. Plus, families can explore the area via horseback or mountain bikes using the park’s dedicated trails. If you have an animal lover in the house, they will be thrilled to see manatees, which call this park home from November through late March. These gentle giants are seen from the platform located near the end of the unpaved Buffer Preserve Drive. Note: Unpaved roads lead you into and out of the park. Families will also want to pack the binoculars as rare birds are also found in the state park. Endangered and rare species such as red-cockaded woodpeckers, Florida scrub jays, Bachman’s sparrows, wood storks, southern bald eagles and the occasional rattlesnake and gopher tortoises are part of the glorious tapestry of this preserve. Families seeking a water adventure can head over to the Sebastian Inlet, a quaint, working riverfront. Capt. Hiram's Resort, the most prolific destination on the riverfront, now offers daily eco-tours on the new River King, a 45-foot Sightseer. Passengers can take in Sebastian’s gorgeous scenic water highway — the Indian River Lagoon National Scenic Byway — which stretches all the way from Titusville to Wabasso Beach and includes the entire Sebastian River area. Guests will spot bottlenose dolphin, waterfowl and pelicans. Evening tours are available to Pelican Island National Wildlife Refuge, the first federally protected nature reserve in the United States. Trips are affordable: $35 for adults, and kids 12 and under only $12 per tour, plus tax. Back on land, the family can enjoy a leisurely stroll along the Sebastian Riverfront, a walkable area with a handful of local restaurants and boutique hotels. The big draw is Capt. 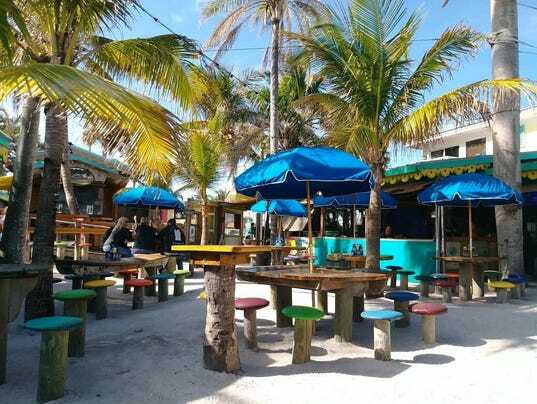 Hiram's, with its Bahamian-styled Sand Bar Beach Club serving traditional American fare, beers and frozen drinks. Yep, parents need to have a little fun too! The club comes alive with a tropical esthetic: picnic tables topped with colorful umbrellas and an outdoor area complete with a white sandy beach. The atmosphere wouldn't be complete without the soft rhythm of Caribbean music and gorgeous water views of Capt. Hiram's marina. If you’re a fresh seafood enthusiast and remember the days of picnic tables dressed in paper tablecloths piled high with shrimp and drawn butter, Crab-E-Bill's Seafood Market is a must. Intrigued by the name Crab-E-Bill's, pretty close to Krabby Patties for all of you Sponge Bob aficionados, my son and I stepped into the marketplace and were instantly greeted by Mellissa, the daughter of Crab-E-Bill. Yes, that's the owner’s name. Crab-E-Bill's Seafood Market is 100 percent sustainable. All of the seafood is locally sourced from around the state of Florida. A few exceptions are their cold-water offerings: scallops and such which are wild caught off the northeastern part of the U.S. The shrimp are wild netted, coming from the Gulf, Cape Canaveral, the Jacksonville area and other seafood towns. A variety of shrimp is on the menu from white to brown, pink and rock. Servers brought to our attention the royal red shrimp, which they said tastes like lobster. None of their seafood is from overseas. How refreshing! We were sold. We entered the restaurant side, placed our orders and sat outdoors on the back porch midday, it was pleasant enough, and a perfect place for a family to see pelicans dive for their lunch and watch local fisherman work on their boats. 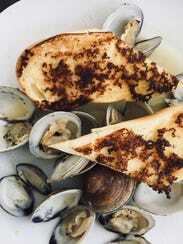 I opted for a dozen steamed clams with scampi sauce to share with my son. (By the way, all sauces and dressings are made in-house.) I also ordered a Caesar salad with blackened shrimp. My son had to have the Wisconsin cheese cheddar curds, aka fried cheese balls, and he loves ahi tuna, so we ordered several of the tuna pops: skewers of ahi tuna chunks served atop a bed of sesame seaweed. Yeah, those didn’t last long! 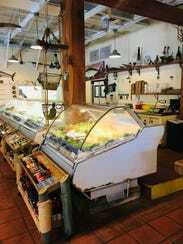 This restaurant and seafood market is one of the freshest seafood eateries I’ve experienced on the east coast of Florida. Y The place was packed with locals putting in and picking up orders. I even heard they deliver — if only I lived closer! We left only after buying a T-shirt. It's a thing my son and I do wherever we visit. Our bellies were full so we decided to take it easy and enjoy a museum tour. 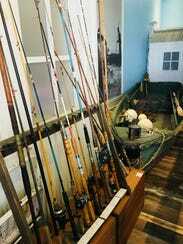 Sebastian has two family-friendly museums: Mel Fisher’s Treasures and the Sebastian Fishing Museum. Either museum is an excellent choice for children because they are interactive and intimate. A family can be in an out in about an hour. Don’t know about you but my son gets antsy pretty quickly! Once inside the Fishing Museum, go ahead and dive in. During our visit, the curator was kind and patient. She patiently took out every seashell that my son wanted to see and had a story for each one. There is also a video loop that speaks to the history of fishing in the area, plus old boats, historical photos, sea critters, sponges and more are all on display. The nice thing about going to this museum is its location within Sebastian Inlet State Park. We left the museum and strolled down to the pier. On our way, we ended up spotting a baby shark and a loggerhead. Not sure of the shark species but it sure did love hiding in the rocks. The fisherman seemed to be having a great day as every time a line came out of the water a wiggling fish was trying desperately to get away. Beyond the Sebastian Inlet State Park, there are few other state parks to consider. The Riverview Park is fun for families and is the park for festivals, craft fairs and family play. A robust playground, walking paths and bathrooms are all located on site. If you bring your four-legged family member, the park offers all that you would expect, plus an area for small dogs. I thought to myself, “how thoughtful.” This is a great place for kids and dogs alike to run around and have fun! OK, if you must go to the beach for the day, Vero Beach is a 10-minute drive, and the beaches are gorgeous with no high-rises — just sunrises perfect for sand-castle building, seashell hunts and hours of water fun. To learn more, visit indianrivercounty.com for downloadable brochures, event listings and more. Zapala is a public relations professional and member of the Society of American Travel Writers. Hard-fighting, delicious amberjacks patrol the deeper reefs and wrecks off Florida’s East Coast. Few places in the civilized world offer such a rich diversity of fishing opportunities as the Sebastian area. Located centrally on Florida’s Treasure Coast, the quaint City of Sebastian thrives among the Sunshine State’s most enviable fresh- and saltwater ecosystems. To the west, in the lakes and marshes of the St. Johns River watershed, anglers enjoy some of the best freshwater fishing for some of the nation’s biggest largemouth bass, crappie and pan fish. Sebastian nestles up against the legendary, 156-mile-long Indian River Lagoon. Historically, the “IRL” boasted more fish species -- nearly 800 species -- than most other estuaries in North America. The diversity and abundance of fish it still produces never ceases to amaze. This wide, shallow estuary also provides the nursery grounds for a great many species that we target along Treasure Coast beaches and offshore in the deep blue Atlantic. So whether you’re simply fishing for dinner or wanting to add many beautiful species and places to your life of list of angling accomplishments, Sebastian is a must-visit angling destination. Sebastian Inlet State Park offers anglers many amenities, including foot access to arguably the region’s best surf fishing, pier fishing and wade fishing. Amenities include campsites, and picnic areas, as well as a bait and tackle shop plus a restaurant. Sebastian Inlet’s north jetty allows anglers to fish the inlet and surf-zone waters. Target species include jumbo red and black drum, flounder and mangrove snapper. Surf anglers plying the “suds” score snook, pompano, Spanish mackerel and many other delicious species. Fall through spring, surf-zone anglers catch delicious pompano on sandfleas, shrimp and clams, or throw flashy jigs and spoons for Spanish mackerel and bluefish. Snook, though, are a star attraction. Snook are only indigenous to South Florida and a tiny sliver of the Texas coast. May through September, schools of the hard-fighting common snook (Centropomus undecimalis), run along the beaches, stack up along the jetties and lurk in the mangroves inside the IRL. This species can be found almost exclusively in Florida, (though a few are found near the border between Texas and Mexico), and one of the world’s healthiest populations exists along the Treasure Coast. Anglers intercept them with flies, lures and live bait. Snook are delicious, but the season is closed June through August. During the open seasons, you may keep only one snook between 28 and 32 inches total length. They’re always fun to catch and release. Fall brings the “mullet run,” a baitfish migration of epic proportions that attracts every predator under the sun. Snook, tarpon and sharks, as well as bluefish, jacks and red drum savagely attack acres and acres of migrating mullet. The feeding frenzies explode along the beach, jetties and IRL shorelines. You never know what you’ll catch next. Boating anglers have access to more of Sebastian Inlet’s nooks and crannies, including ledges that serve as ambush points for flounder getting ready for their late fall spawning migration offshore. Vertical jigging for pompano and Spanish mackerel is also effective during winter. Big schools of “bull” redfish, snook and bluefish often stack up in the rips that are difficult for shore anglers to reach. In spring, summer and early fall, tarpon are caught off the beaches, up the rivers and throughout the Indian River Lagoon. A high-relief limestone reef runs a few hundred yards off the beach from the south side of Sebastian Inlet just about all the way to Fort Pierce. 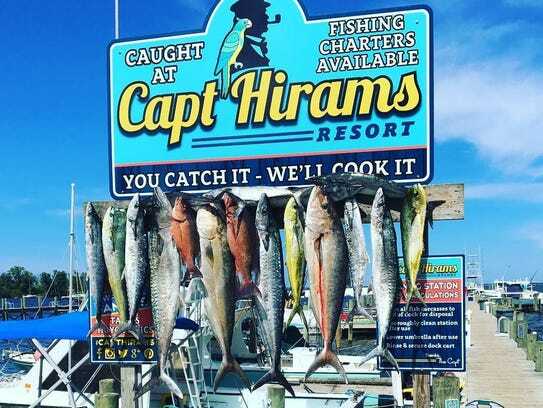 Especially during the spring and summer months, schools of tarpon, giant jack crevalle and false albacore, as well as sharks and cobia, swim along the reefs, maurading the bait pods. These fish are often up on the surface, offering exciting sight-casting opportunities for fly fishermen and anglers casting lures and bait with conventional tackle. The IRL is a flats fisherman’s paradise. Snook, red drum and spotted sea trout are among the top all stars. If chasing world records interests you, the Sebastian area is a top place to get on the leader board with all three species. Other popular targets include pompano, tarpon and sheepshead. Wading anglers and kayakers enjoy the advantage of stealth from access points such as Sebastian Inlet State Park and Long Point Park, among many roadside access points. Live bait such as shrimp fished under a popping cork works well, as does a variety of surface and subsurface plugs. Flies, soft-plastic shrimp and jerk baits also excel. Anglers fishing in skiffs work the flats and shorelines, also putting stealth and sun to their advantage. They sight fishing and blind casting with the same baits and lures. The lower St. Sebastian River, which empties into the IRL just northwest of Sebastian Inlet, hold lots of big trout and plenty of redfish. Work the docks, oyster bars and mangrove shorelines around the railroad bridge. The upper river, which flows through St. Sebastian River State Park, is an unforgettable place to fish from canoe or kayak. The river winds through high bluffs lined with hardwood hammocks. It produces a mix of fish that can handle very fresh water, including tarpon, snook, and bass. A clear blue ocean river, the Gulf Stream current, flows north along past the Treasure Coast and all along the Eastern Seaboard. Migratory species such as sailfish, mahi and wahoo travel on it, hunting in packs along its edges and eddies. Fishing for reef fish including many species of snapper and grouper is also highly productive in the blue water that beckons off Sebastian Inlet. Deep-sea fishing excitement awaits the adventurous fisherman. Find high quality bass and panfish action just west of Sebastian in the Stick Marsh/Farm 13 impoundment, Lake Garcia, Lake Kenansville and Lake Blue Cypress. The biggest bass typically come out of the Stick Marsh/Farm 13, which is a specially managed as a catch-and-release only trophy bass lake. Lake Garcia is a shallow, weedy impoundment known for numbers plus a few big fish. Lake Kenansvile produces great catches of crappie as well as bass. For sheer beauty -- and great fishing -- Lake Blue Cypress is unforgettable. A guide coaches an enthusiastic angler hooked up on a big snook in the Indian River Lagoon.